This series strives to accurately and completely represent the narratives found in scripture as well as impart the foundational evangelical doctrines of God's Word. We believe the Bible is, "Profitable for teaching, for reproof, for correction, for training in righteousness," and therefore seek to fill the hearts and minds of our children with its truth. Seriously, isn't that some good stuff? The product description page offers great suggestions for all age groups. 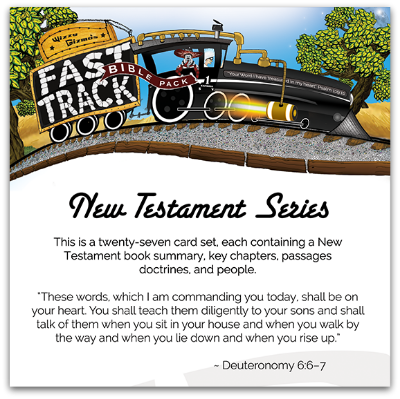 Each of these age groups includes the suggestion to read the card summary and theme every day for a week. It also recommends reading the author, date, number of chapters, and a key verse or doctrine from the card every day. The older age groups add more suggestions, but these recommendations are consistent for all age groups. I have seen in our memory work lessons how daily reading of the same material can quickly embed the lessons in the brain. It seems so simple, but it really does work nicely. I'm not sure that I'm all that concerned about my children memorizing how many chapters are in the book of Matthew, but there is a lot of great stuff on the cards that I DO want to stick with them. I like to read through the New Testament each year with my kids using the 5x5x5 plan. This takes only five minutes a day, five days a week to finish the entire New Testament in one year. These cards make such a nice addition to that lineup. We can get through the cards in less than five minutes a day. This set costs $14.99, a reasonable price for a nice quality product. Wizzy Gizmo has other great products to offer. Be sure to click below to see more reviews of this great company.